The annual Suoni Per Il Popolo festival is right around the corner and we’re all pretty psyched for the insane lineup of artists who are rolling through Montreal this June. Personally, I’m really looking forward to Pharmakon, Peter Brotzmann & Heather Leigh, Princess Nokia, Pelada, Moor Mother, and Les Filles de Illighadad — but there’s so much more, it’s honestly a bit hard to keep track of. Stay tuned for plenty of CKUT coverage as the festival progresses! 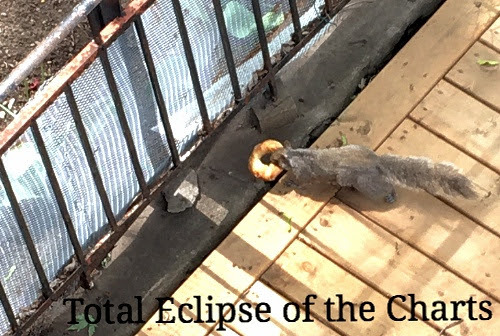 Last week’s garbage-feasting raccoon was a big hit, so as a followup here’s a squirrel I spotted in my front yard last week with an entire St. Viateur bagel in its mouth. I wasn’t kidding about our wildlife being gluttonous. Suoni, that’s what’s up! We’re dedicating a lot of our programming, including both ourMontreal Sessions and If You Got Ears residency programs, to the famously ear-bending festival for the month of June. Keep an eye on the blog for artist interviews, concert reviews, and other special features over the next three weeks — we’re going all out on this one and you’re invited along for the ride. This entry was posted in Charts and tagged critters, specialty charts, Suoni Per il Popolo, top 30, total eclipse of the charts on May 30, 2017 by CKUT Music Coordinator.